A few weeks ago I went to San Juan in Puerto Rico on an “art exploration” trip invited by Walter Otero and his amazing eponymous gallery. I summarized the highlights of my trip in an article I wrote for DuJour and that can be found here. The size of the studio is impressive as are the height of the ceilings. One of the artists who moved me the most is Arnaldo Roche, who is, without any reservations, one of Puerto Rico’s most important living artists. His studio, which is housed in a massive warehouse in the area of Carolina is impressive to say the least. 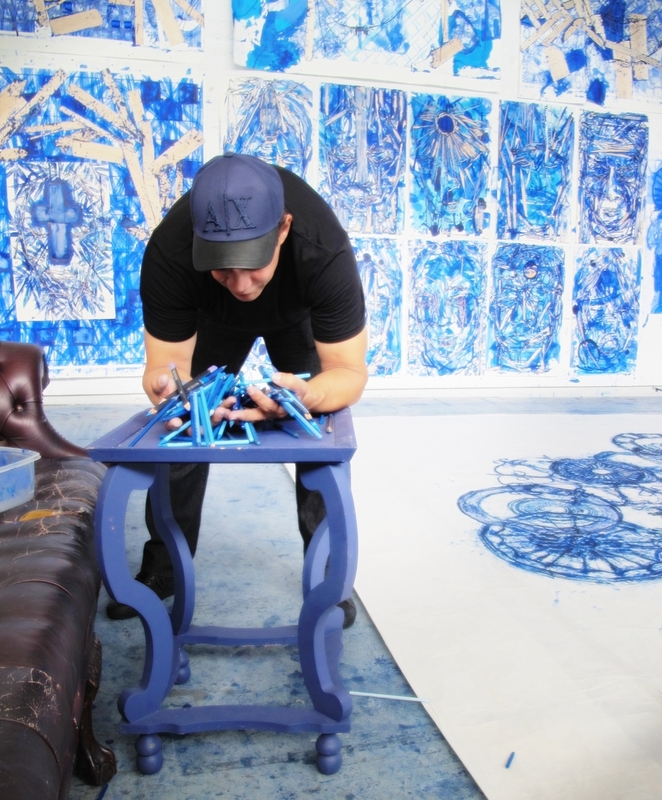 The ceilings are 18 feet tall and the space is covered in papers and raw canvases, all of them executed using a combination of blue tones ranging from indigo to periwinkle. 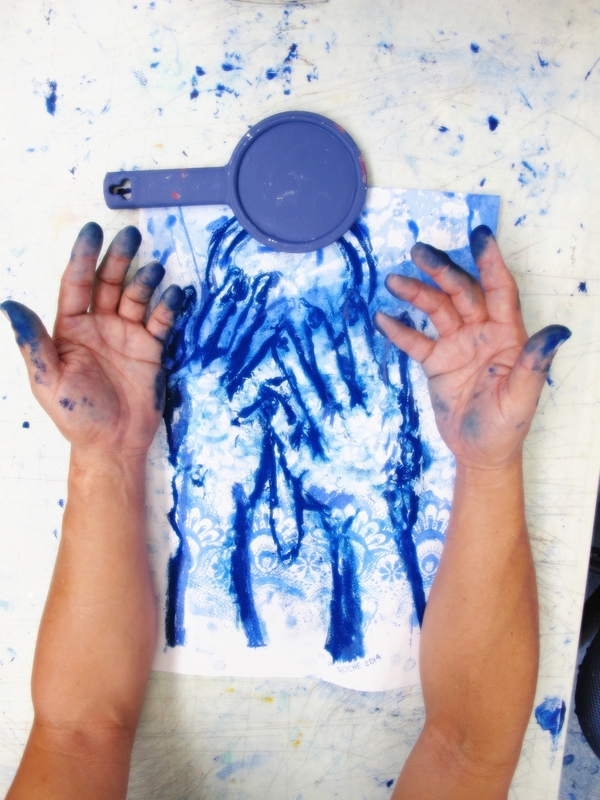 Arnaldo is in his “blue period” and has been exploring it in-depth. Blue, to him, is the negation of an older phase were other colors he used represented drama and sadness. Blue for him is turning the page on that. 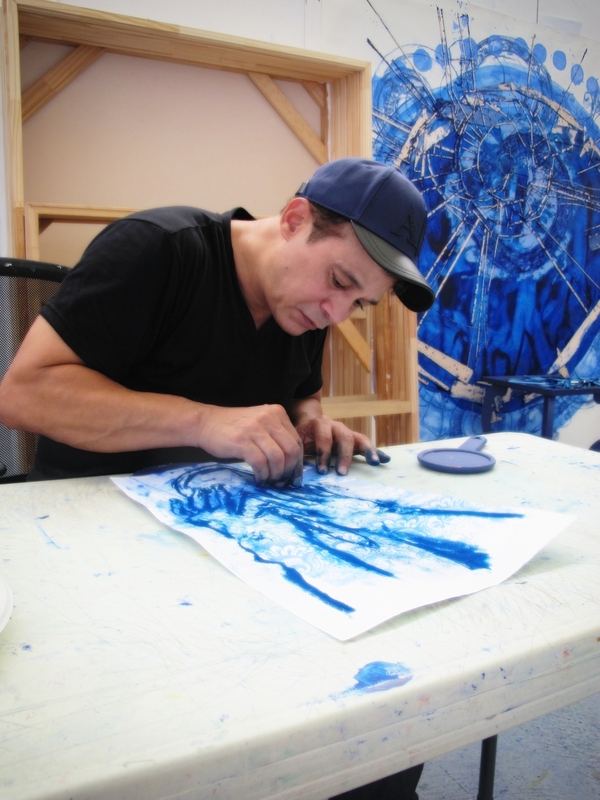 Roche is very humble and avoids the limelight, but he has had a brilliant trajectory that started with becoming one of the very first Latinos to get his BFA and MFA from the School of the Art Institute of Chicago in the 1980s. Now, his pieces are in the permanent collection of the Metropolitan Museum of Art in New York, the Art Institute of Chicago, the RISD Museum in Providence and the De La Cruz and Rubell Collections in Miami among many others. He considers himself a contemporary existentialist who is obsessed with immediatism. Infinitely talented and with a technique I had never seen before, he uses objects and people as models that he places under paper which he then rubs with either oil bars, pastels, pencils or whatever he feels is the best medium to accomplish his objective. Basically, he turns the three-dimension of humans and things into a bi-dimensional plane. Alternatively, he prepares canvases that had been covered in layers and layers of oil paint. After the right drying time (usually several days), he uses a knife to carve and discover the textures that remain underneath. He offered to make a piece using my own hands, which he covered with a piece of paper that he had previously dyed with watercolor depicting a delicate strip of lace. He worked quickly, intensely and with confidence. In a matter of minutes we had an outstanding work on paper. Part of what Roche told me that left me thinking is that while he knows he could have had a great career in the United States, he chose to return to his Latin roots. “I enjoy speaking English, but I dream in Spanish” is one of his most poignant phrases I heard him say during our time together. And one I decide to remember every time I think of him.